The family history in this web site begins with Hiram Milton Tremble (1808-1881) and Sarah Sawyer Tremble (1815-1878) - pioneer family of Coles County, Illinois. According to Coles County marriage records, Hiram and Sarah were married there on 14 March 1833. Hiram purchased 40 acres in Coles County for $1.25/acres on June 14, 1833. This was a second marriage for Hiram whose first wife, Mary Jackson, died in Shelby County, IL in 1832. Hiram had four children with Mary and eleven with Sarah. The family resided in Coles County until the Fall of 1886 when Charles J. (b. 1849) and Martha Ellen (Jones) Tremble packed up their family and headed for California, probably via the railroad, arriving approx. Sept. 3, 1886, according to the obituary of their son, Elmer Tremble (Sept 3 was his birthday). The Tremble surname boards have now all been combined into one Tremble Message Board which will include queries, biographies, births, cemetery, census, deeds, obituaries, pensions, wills, Bible records, etc..
Related ancestor names of this line include: Grove, Laws, Jones (2 lines), Smith, Dunham, Gray, Noe, Dumont, Holton, Radley, Radcliffe, Richardson, Allen, Sharp, Drake, Walker, Trotter, Martin, Bonham, Fuller, Lathrop, Tilson, Billiou, Zabala, Jones, Talbot, Schooler, VanDeren, Murray, Munson, VanHorn, Durham, Bugg, Sturgeon, Wharton, Trueblood, White, Bacon, Lyddall, Richardson, Bush, and various spellings of Tremble. 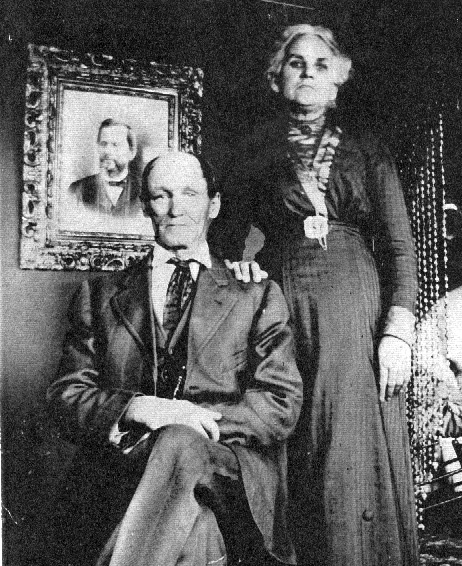 Photo Left: Charles J. and Martha Ellen (Jones) Tremble. Photo taken in Los Angeles, CA about 1900. The portrait on the wall in the background is believed to be Charles' father, Hiram Milton Tremble. They were among several members of the Tremble family who went to California and other parts west in the late 1800s. Many thanks to Marjorie Deniston for providing the picture. If you have additional information related to any of the families included here, please contact me. This is a work-in-progress. If you find any of my data to be either incorrect or incomplete, or if you would like any additional information, please e-mail me. Hopefully this site will continue to grow as we meet new "cousins." Thanks! This web site and its contents in the format presented, except where otherwise noted on the page, are copyrighted by Linda Schwartz and may not be copied, altered, converted nor uploaded to any electronic system or BBS, nor linked from any "pay-for-view" site, linked in such a manner as to appear to be part of another site including "frame" capturing, nor included in any software collection or print collection of any type without the express written permission of the author of this site, namely, Linda Schwartz.